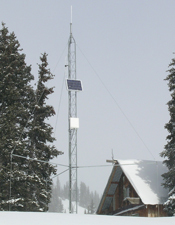 The Center for Snow and Avalanche Studies is home to “CODOS”, the Colorado Dust-on-Snow program, an applied science effort funded directly by a collaboration of Colorado and regional water management agencies. 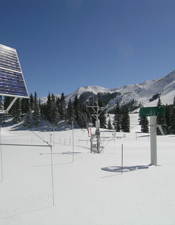 Research funded in 2004 by the National Science Foundation and led by Dr. Thomas Painter has shown that winter and spring depositions of desert dust from the Colorado Plateau onto Colorado’s mountain snowpacks can dramatically reduce snowcover albedo, advance snowmelt timing, enhance snowmelt runoff intensity, and decrease snowmelt runoff yields (see Geophysical Research Letter, 2007 and Proceedings of the National Academy of Sciences, 2010). As a partner in that research, CSAS engaged Colorado’s water management community during the summer of 2006 and has been presenting these findings ever since, at quarterly board meetings of local water districts, Colorado Water Congress and Colorado Water Workshop sessions, regional IBCC Colorado Roundtable sessions, and other technical meetings hosted by the Bureau of Reclamation. 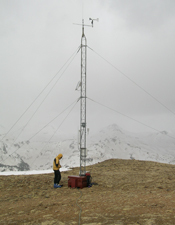 Now, with direct funding support from those stakeholders, CODOS monitors the presence/absence of dust layers at ten mountain pass locations throughout the State. 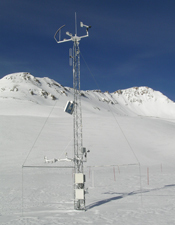 With those data, and data from nearby Snotel sites, and given the weather forecasts for those watersheds, CODOS provides its funders and their agency partners with a series of “Update” analyses of how dust-on-snow is likely to influence snowmelt timing and rates during the snowmelt runoff season. 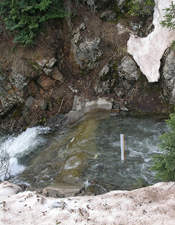 That information assists reservoir operators, municipal and agricultural water providers, flood risk managers, and others at local, State, and Federal agencies responsible for managing the spring runoff water that is so vital to Colorado and to states downstream on the Colorado, Rio Grande, North and South Platte, and Arkansas rivers. 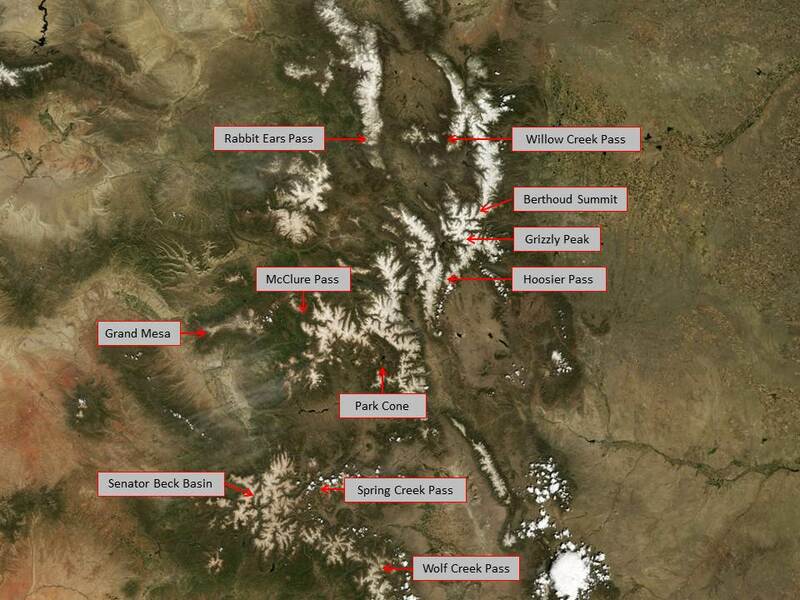 Dust-on-snow research led by Dr. Painter continues at the CSAS’s Senator Beck Basin Study Area at Red Mountain Pass and at other locales in the Upper Colorado River Basin. 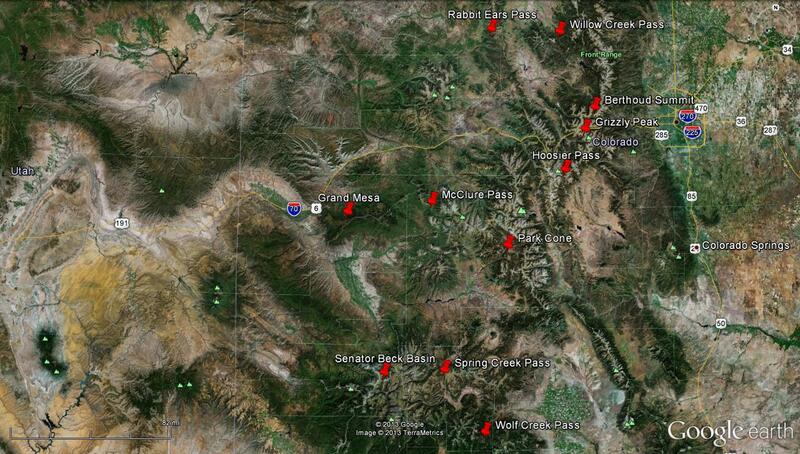 CODOS Sites Overview Maps. Click the maps below for larger versions. The CODOS site atlas and KMZ file are available to CODOS stakeholders upon request.